In the world of trading where 5 minutes can seem like an eternity, 5 years feels like a really long time. That’s the number I’m celebrating today, as it was 5 years ago today that I published my first post over at my original blog. I spent one year writing there before creating TheStockBandit.net. I’ve been writing here ever since, publishing some 480 posts during this stretch. Thank you for your videos and reviews. I appreciate it very much. Happy to help Rofsjan, thank you for reading & watching! Jeff – I’ve been a member of TheStockBandit.com for over two years now. I look forward to your nightly posts and I’ve attended TheStockBanditUniversity.com. While I enjoy your trade suggestions immensely, the thing I appreciate the most is all you have taught me over the years. Because of you, I consider myself a seasoned (but continuously learning) trader. 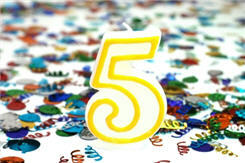 Congratulations on your five year anniversary & here’s to the next five! Thanks so much for your comments, that sure means a lot. It’s certainly rewarding to know you’ve learned and improved and profited from the effort I’ve put forth. I’ll continue putting out my best, and as always, you can reach out to me for any help I may be able to offer. I appreciate you taking a moment to share this, and I hope your trading only continues to get better!